Hybridised in Australia by the late Ted Both, and introduced in 1959, "Glowing Ember" is a regal type pelargonium with a compact growth habit. The flowers are a rich golden orange with a violet/lavender and typically feathered centre. Ted Both is better known as the introducer of the Stellar pelargoniums but he also hybridised many other types of pelargoniums. 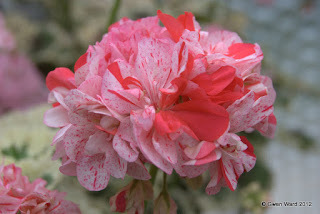 My photograph was taken last year at the National Collection of Pelargoniums. 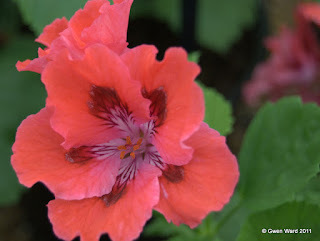 You can find the details here, or under the Pelargonium Nurseries page above. Dwarf bi coloured zonal "Vectis Embers"
A really attractive dwarf zonal with spotted red petals on white, which contrast nicely with the green and white bi-coloured leaves. Pelargonium "Vectis Embers" was hybridised by the late Brian West and introduced by Gosbrook Pelargniums in 2009. Brian West gave the pre-fix ‘Vectis’ to many of his plants. He lived on the Isle of Wight and Vectis is the old Roman name for the Island. 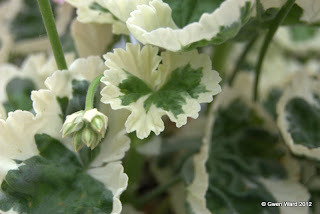 Leaves of Zonal pelargonium "Vectis Embers"
One of my greenhouses was flooded again when we had the recent heavy rain. The other greenhouse which was not, oddly, had some botrytis on the plants. I spent a day grooming all the plants in the greenhouse and everything looks a lot fresher now. Fortunately the flooding receded quickly and the plants in that greenhouse do not seem to have been affected by the botrytis.